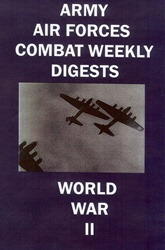 The Army Air Forces Combat Weekly Digests 11-15 WWII DVD contains five films of weekly air combat updates from the European, Pacific, and CBI Theaters. Film #1 - Combat Weekly Digest 11: 11 December 1943 - Kunming, Chinese and US officers inspect wrecked Chinese aircraft transporting bank notes. US Army nurses arrive. Germans raid Bari, Italy. Reconstruction of Italian field at Foggia, Bougainville. Bombing Jap ships off Rabaul, New Britain. Film #2 - Combat Weekly Digest 12: 7 January 1944 - Burma Road, China. Emergency work B-17 "Stella", somewhere in England. The Jap Hamp, Strafing Bougainville, gun camera. Film #3 - Combat Weekly Digest 13: 14 January 1944 - Alexai Point, Attu, Bombing of Bougainville, Solomon Islands. The German Junkers 88. Chinese American Wing Kweilin. Return of Kowloon mission crew. Target Germany. Film #4 - Combat Weekly Digest 14: 21 January 1944 - Ondal, India. Snowslide Attu, Aleutians. Removal of wrecked P-40, Kunming China. Empress Augusta Bay surrounded Marines supplied by parachute. Target Germany. Film #5 - Combat Weekly Digest 15: 31 January 1944 - First cargo planes reach Empress Augusta Bay, Calcutta, India, supplies unloaded, Air raid, Calcutta, Native rescuers rewarded, India, India exhibition drill. Bombing of Burma. Allied offensive over Europe. 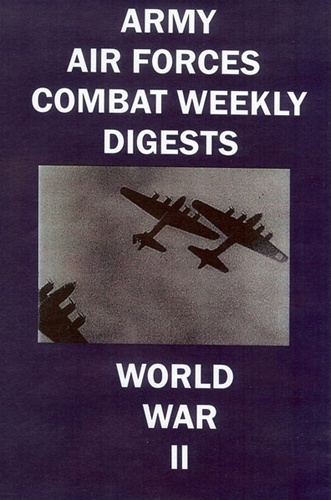 Total run time for Army Air Forces Combat Weekly Digests 11-15 WWII DVD is 1 hour, 37 minutes in B&W. Format is NTSC DVD.